Although the kelvin will be defined in an entirely new way, the redefinition will have little immediate practical consequence for how the unit is realized or how temperature is measured. There are several reasons for this. One is that the triple point of water will remain a reliable calibration point because, although it is not a fundamental constant, it is regarded as an unchanging physical property in a well-defined experimental setup. Moreover, thermometer technologies have not yet advanced to the point at which they can significantly reduce the already-small uncertainty in measurements of the TPW. The Consultative Committee for Thermometry, which makes recommendations to the CIPM, notes that multiple independent TPW measurements, which strictly follow the mise en pratique, vary by less than 50 millionths of a kelvin. Finally, the temperature values for the reference points in both ITS-90 and PLTS-2000 are specified with no uncertainty and will remain fixed until the scales are replaced. In the future, however, this will change. Presently, the specified instrument for realizing the kelvin through the triple point of water is a standard platinum resistance thermometer (SPRT). Although the devices are accurate and dependable across a wide temperature range, and can be quite compact, they are relatively costly (many thousands of dollars each) and particularly sensitive to shock and vibration. 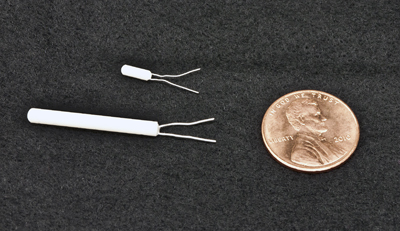 Image of a platinum resistance thermometer sensor, with a penny next to it for size comparison. In addition, SPRTs are not ideally suited to the measurement science community’s near-term goal of basing measurements, to the greatest degree possible, on fundamentally invariable quantum-mechanical phenomena. (For example, the second is measured by tuning instruments to the frequency of specific energy level differences in cesium-133.) There are several possibilities for quantum-based temperature measurements, and highly sophisticated options are being developed at NIST and elsewhere. 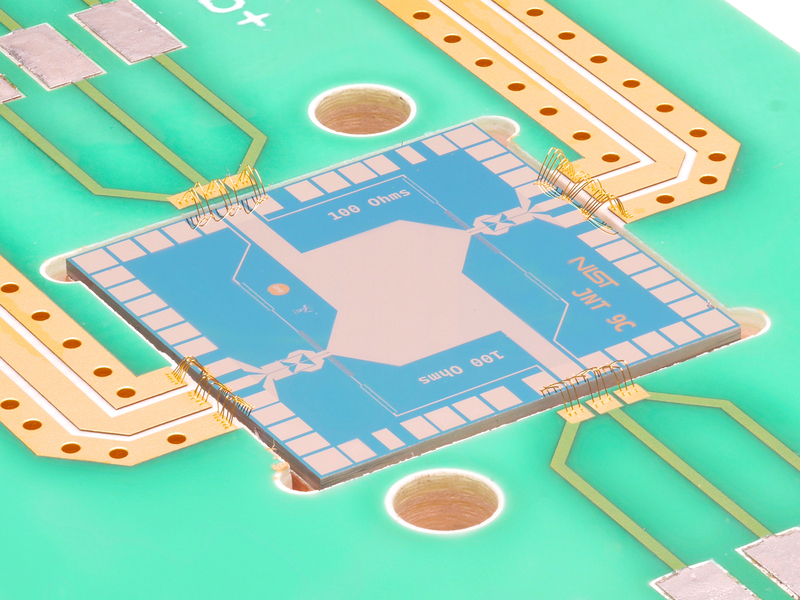 The 1 cm2 microchip used for NIST’s Johnson Noise Thermometry work, fabricated at the Boulder, Colorado, campus, which made measurements of the Boltzmann constant. Another promising approach is photonic thermometry, which measures temperature by detecting its effect on light. Temperature affects both the physical dimensions of objects and their optical properties — that is, variations in temperature alter the speed of light in a medium such as air or water through the thermo-optic effect. Instead of measuring an electric signal, as in a standard platinum-resistance thermometer, photonic thermometers detect changes in the frequency of light, which can be measured with much higher accuracy. An electron micrograph (top) and illustration (bottom) showing the vibration of a silicon nitride beam used as an experimental "quantum thermometer." which enables temperature to be connected to the quantum-mechanical motions of a system. Yet another concept is a “quantum thermometer” under development at NIST. It works by measuring the tiny motions in nanometer-scale mechanical systems that follow the counterintuitive rules of quantum mechanics. It enables temperature to be connected to the quantum-mechanical motions of a system. Only time will tell what will end up being the most popular technique for accurately measuring temperature.